Set on the less-populated east side of Coleman Boulevard, Mill Street Tavern is the latest to join the burgeoning Shem Creek Strip. 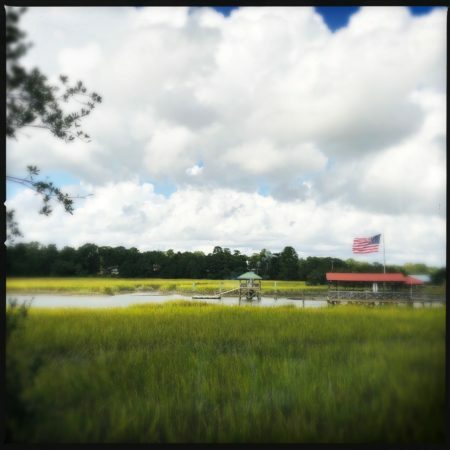 In these parts, where the views are marshy and the menus are decidedly American, Mill Street is no exception. Similarly, it offers more than one bar, ample water views, and a laid-back vibe — just like everybody else — but one thing that patently sets it apart is the building itself. Described as being “housed near the site of the ‘Greenwich Mill,’ the first tidal mill in the world,” it promises that “guests will see a recreated mill as they approach the property and period artifacts via see-through panels in the main dining area.” Indeed they will. The multi-story structure is a hodgepodge labor of love that could be described as Epcot World Showcase meets live history museum meets Bavaria. Specifically, the dining room floor features plexiglass panels revealing relocated mill equipment in the manner of a Roman ruin. Above, find everything from exposed brick and rugged pine booths to what looks like a repurposed chapel surrounding the indoor bar. It’s a patchwork salmagundi effort, and clearly a heartfelt one at that. Another distinction is the brunch menu, which runs from 10 a.m. until 3 p.m. seven days a week, effectively replacing the meal more commonly known as ‘lunch’. Don’t really feel like pancakes at 2 p.m. on a Tuesday? Well, that’s too damn bad, as that’s what’s up. Well, not really, as there are a few traditional lunch-type options in the mix, including the tavern burger ($11.99). Served as a double decker, each of the chunky patties is about two-thirds the size of the seared potato roll. Although it’s unclear why one would elect this undoubtedly messy approach, the burger itself is top-notch. This is no big surprise, as sister restaurant Crave is revered for its mastery with ground chuck. In kind, the juicy patties are hard-charred and topped with melty pimento cheese, then adorned with two slices of tomato, a leaf of romaine, and a thick chunk of red onion. Served with a landslide of matchstick potatoes, there is nothing to complain about here. 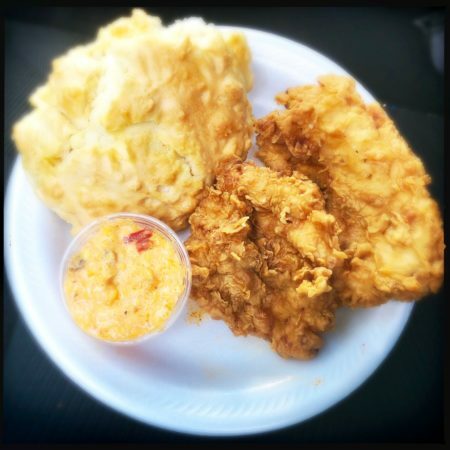 On the breakfasty side of things, the Southern fried chicken and biscuits ($9.99) was a highlight. Two perfectly fried pieces of boneless chicken breast are tender and juicy inside, and the light, crispy breading a delight. While the gigantic drop biscuit is beautiful to look at, it’s otherwise unremarkable. Less Charleston Nasty than Bisquick, it’s accompanied by a serving of the same fresh, flavorful pimento cheese that tops the burger, rendering it one of the more successful dishes I tried. If bang for your buck is the draw, note that the hash of the day ($9.99) is utterly gargantuan. At the waiter’s urging, I added two eggs ($3.99), rendering it a feast of button-popping proportions. Mount McHash of the Day starts with a hill of cubed O’Brien-style potatoes, fried up with bits of onion and bell pepper. It’s then topped with a layer of totally unnecessary melted cheddar cheese, upon which lies a butte of sweet barbecue sauce-slathered shredded beef brisket. The two over easy eggs only add to the decadence. Easily enough food to satiate two very hungry people, I wouldn’t have any shame setting it in front of a family of four. On the dinner side of things, the larger-than-life theme continues — at least in the nomenclature — with the jumbo wings ($11.99). Accompanied by a choice of side, the eight, nicely smoked wings are billed as jumbo, yet were indistinguishable from what I would call ‘regular wings.’ But no matter. Embellished with a spicy, sweet rub, this is a satisfying choice made even more so by the addition of fried Brussels sprouts ($4.99 as an individual side). 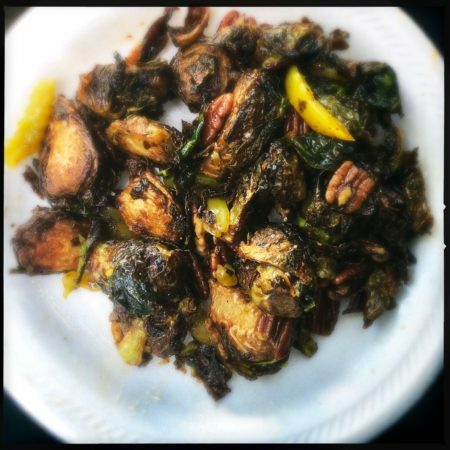 Oily, salty, and tossed with roasted pecans and slivers of pickle, there’s no way this is good for you. Still, what’s life without a little guilty pleasure? On that note, service was so friendly, I wondered if perhaps our waiter was suffering an episode of love at first sight. Helpful with suggestions, anxious to learn — and remember — our names, and eager to give a tour of the place, even wistfully inquiring if I would be coming back again as soon as I left. Although I’m unsure if everyone gets this treatment or I just missed a love connection, safe to say service is doting, bordering on lovesick. As I had failed to sample the shrimp and grits ($14.99) at lunch/brunch, the grilled jumbo shrimp ($13.99) with a side of grits ($3.99 as an individual side) seemed like a good compromise. Now I don’t know if super jumbo is an official size, but — much like the wings — I can tell you it’s not as big as it sounds. 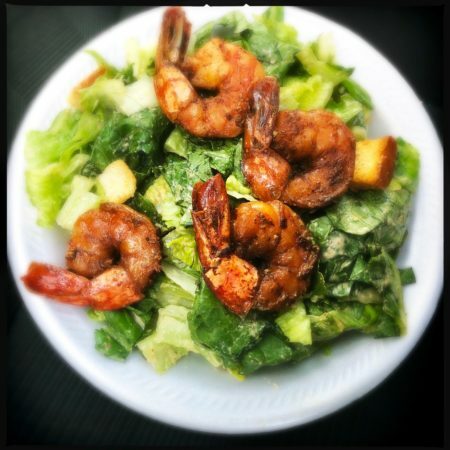 More like ‘agreeably large,’ the four grilled shrimp are flavorful, but with all the real estate remaining on the plate, the portion feels deficient. For their part, the grits are plentiful, but dense. Possessed of a light orange hue, it appears cheese was involved in their preparation, yet the only discernible flavors are those of hominy and salt. 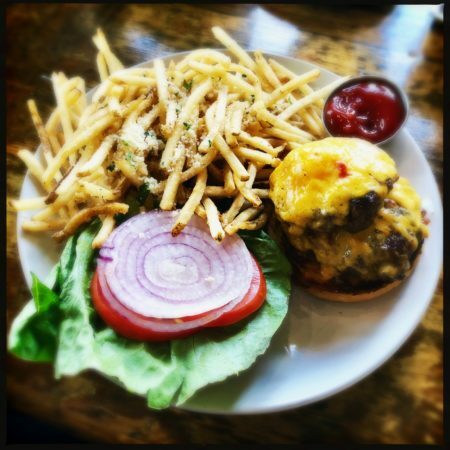 With its quirky decor, stellar views, and expansive menu, it’s likely most everyone in your party will find something to love about Mill Street Tavern. And while you’re at it, with any luck, the wait staff may just find something to adore about you.